For 2011-12 it has just announced that it's going to be Russia, and the 2014 Winter Olympic resort of Sochi which Brits will now have the chance to ski before the crowds descend. 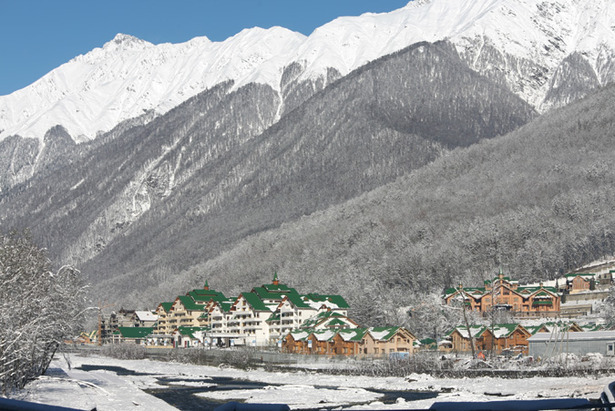 In fact the Krasnaya Polyana ski are has been a major Russian ski destination for some decades, but was originally several hours drive from the Black sea coastal beach resort city of Sochi. That has all changed over the past six years, thanks in large part to the support of Russia's former president Vladimir Putin, a very keen skier, who has driven forward with billions of dollars/rubles/pounds of improvements ahead of the Games. In terms of infrastructure these have included the construction of a new road and tunnel system which has cut driving time to the ski slopes from Sochi to under an hour and the construction of three new ski resorts to very high standards and a world-class scale on and off the slopes. The ski lifts already built or under construction include several that will be among the biggest, fastest and best in the world and with several dozen being installed, Sochi is set to become one of the world's leading ski destinations for the 21st century. Only one resort (Gasprom) is nearly complete, the other two resorts do have cranes and building work going on. The fourth resort will not be finished until the Olympics. With two winters to go before the Olympics, the first resorts are nearing completion and one of the initial issues for skiers wanting to visit the area has been finding convenient flights to Sochi. Crystal have opted to use the scheduled service offered by Turkish Airlines including flights from Heathrow via Istanbul to Adler/Sochi airport with private transfers. 4 or 8 night holidays will be available at either the five star Grand Hotel Polyana in Gasprom resort where prices will be from £935 per person on half board, or at the four star Hotel Park Inn by Radisson in Rosa Khutor with prices from £825 per person on half board. As the packages are all tailor made, Crystal can also organise city-add on in Istanbul if anyone wishes to stay there. In addition to the basic holiday cost all skiers and boarders heading to Sochi must obtain a Visa at a cost of £130. Crystal help with advice and by supplying letters to customers confirming they've booked which they'll need for the application. There's no interview, just a form to complete, which can be delivered in person or by post to the Russian consulate. The service normally takes five days but a 24 hour express service is available. Sochi's resort developments are so new that the exact scope of lift passes is yet to be finalised. Currently it is not clear whether a joint lift ticket valid at the different ski areas will be available but Crystal are confirming they'll provide lift passes for the local area where the hotel is based. "We are working with the local lift pass companies to get some kind of ‘voucher' organised so that our customers can ski in all three areas, but at the moment, each resort (actually hotel!) have their own lift pass." said a Crystal spokesperson. The hotels are both 3-5 minutes walk from the lifts and the first holidays will depart on 15th December.